This post comes with an experience of hosting and participating in Twitter Chats for more than 4 years. #SEOTalk Twitter Chat was born 4 years back and I have been participating in various Twitter chats even before that. Over the years that we have been hosting the Twitter Chat, we have had some fabulous engagement within the community and that has helped us notch some awesome stats. We have organically trended in India multiple time including the first time #SEOTalk was conducted and have been able to reach wider audience over a period of time. 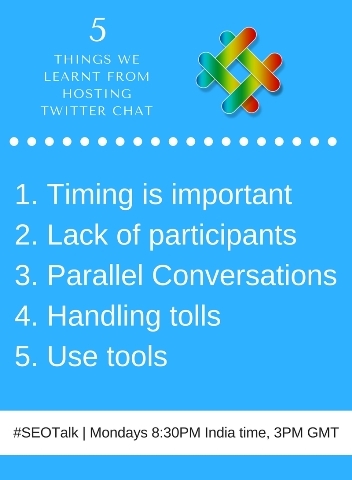 So here are few things that we learnt in course of time and that might help you if you intend to start a Twitter Chat of your own or join as participants. Once you have identified the gap, then launch your own chat keeping in mind the targeted audience. After our initial research, we found that most of the participants prefer to have these conversations in evening so as not to disturb their routine tasks during the day. Also, Fridays were supposed to be avoided as most of the folks would either be devoted for friends or family. We specifically wanted to appeal to the Indian audience and knowing their preferences, kept the timing for Mondays, 8:30PM Local Time. Sad reality of Twitter is there are enough trolls out there to hijack any conversations. Their intention may be to sell services, product or anything under the sun by leveraging your reach. On the flip side, there could be some honest mistakes as well, where automation could have gone wrong eg. Retweeting of any tweets with the hashtag, adding to list, etc Action Tip – We have immediately marked account as spam and notified Twitter, which would mean that few of those accounts are banned. We also notify other participants of such spam so that they can even take similar actions. Action Tip: Use combination of tools and devices. One device can have a stream running on Tweetdeck where the mentions are being tracked while the other device can use other tools to engage in the chat. We hope these recommendations and action tips will be useful as you host or participate in Twitter Chat. We have indeed learnt few things from our mistakes too, so happy learning!! 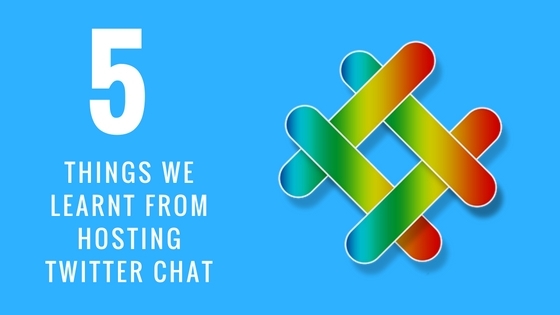 What has worked for you as a host and participant of Twitter Chats? Do you participate regularly? What makes you participate in Twitter Chats?